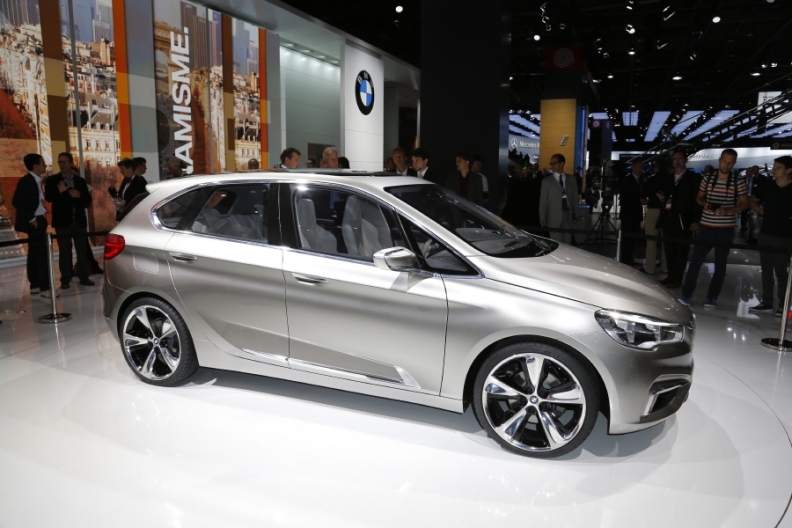 The BMW Concept Activity Tourer, shown at its Paris show debut, previews a Mercedes B class rival. The battle for the top spot in luxury car sales over the next decade likely will be decided by who wins the largest share of the expanding market for smaller premium cars. Current No. 1 BMW believes its new front-wheel-drive architecture will give it a competitive edge against German rivals Audi and Mercedes-Benz. Both automakers have vowed to overtake their Munich-based competitor. BMW says its new fwd architecture, known internally as ULK, will be key to the company's future growth. Company executives dismiss complaints from the brand's traditional followers that fwd is a step too far from BMW's rear-wheel-drive heritage. "In the '90s we broke with tradition when we began selling SUVs along with our sedans," Frank Niederlaender, the company's product manager for front-wheel drive, told Automotive New Europe in an interview. "Customers realized they could get the driving dynamics BMW is renowned for from an SUV. We will see the same transition happening with front-wheel drive," he said. Klaus Draeger, BMW's head of purchasing, who helped create the UKL architecture during his tenure as the company's r&d boss, said that by 2020 the automaker expects to have a huge share in fwd models. "We are entering into new segments and are getting new customers who will learn you can drive very well with front-wheel drive," he said. BMW sales and marketing chief Ian Robertson said the premium small car market will become the fastest-growing segment and BMW's fwd platform will help the company take advantage of the growth. "One of the big advantages of UKL is that we are able to launch a lot of products almost simultaneously because we are doing the engineering at once," he said. The fwd architecture will enable BMW to offer additional interior space in its smaller vehicles. The current 1 series has been criticized for its cramped legroom for backseat passengers. That problem is expected to go away because the next-generation 1 series will be underpinned by UKL. "We will attract a broad profile of customers, from young families to people entering the later phase of life," Robertson said. Niederlaender said that up to 12 BMW and Mini cars, accounting for 40 percent of the group's unit sales, will be underpinned by the platform, or variations of it, within eight to 10 years. Europe will be the main market for BMW fwd cars. The region is leading a global trend where customers are downsizing to smaller models, both because they have less cash to spend and because regulators are introducing tougher CO2 emission limits. But Niederlaender sees opportunities in other major markets. "We are seeing growing acceptance of smaller premium cars in the U.S. and China," he said. In the United States, customers may choose a fwd BMW as a secondary household vehicle, he said. Draeger said the fwd platform will be used for a wide variety of smaller BMWs and Minis. "There will be several options for different wheel bases and widths of upcoming models. With one model family, we can do a typical front-wheel hatchback, a larger hatchback, or a small SUV. We can use that architecture not only for the Mini but also for other BMW products that are a little bit bigger and higher and more spacious with a bigger interior." He said BMW's larger vehicles from the 3 series and upward will remain rear-wheel drive. "These are powerful cars so I really don't see a front-wheel-drive model in this segment as being a successful," Draeger added. The Concept Active Tourer unveiled at the Paris auto show in September previewed BMW brand's first model underpinned by the architecture. A production version of the high-roof vehicle is due to launch next September as a rival to vehicles such as the Mercedes B class and Volkswagen Golf Plus. Niederlaender said BMW will attract new customers with the production version of the car, which will be similar to the concept. "It shows a car that will be attractive to families who need a functional and versatile vehicle with lots of room and a high seating position," he said. Premium cars are moving from an emphasis on luxury equipment and large size toward advanced powertrain technology, lightweight materials and overall efficiency. A growing customer acceptance of smaller premium-brand cars. The result will be that the BMW brand will easily meet its target of 2 million annual unit sales by 2020, thanks to growth through models based on the fwd platform, said IHS Automotive. The consultancy forecasts that BMW will sell 960,000 BMWs and Minis built on the fwd architecture annually by 2020. BMW Group sales, including its Mini and Rolls-Royce brands, will rise from a forecast 1.76 million units this year to 2.58 million units by that time, with about 70 percent of this growth coming in the compact and subcompact segments, according to IHS.